Though I’ve only been here for a week, I have already learned so much about the city of Firenze (Florence). Between the shopping, weather, social norms, and food, the culture here is so much different from America. I’ve been enjoying every moment of it! The apartment is in a great location; right next to the river, a close walk to the school buildings, and the streets surrounding my building are all (expensive) shopping stores – we live on the corner of Gucci. Inside, the apartment is fairly modern looking with tall ceilings, a glass staircase, and windows that look out onto the busy streets below. I think we lucked out with this study abroad housing assignment. As I mentioned, shopping makes up a huge part of Florence. Stores of all kinds (clothing, food, luggage, liquor, hotels, even a store dedicated to rubber duckies) line the streets. My favorite places to walk through are the leather markets – here, you are able to barter with the salesmen for everything leather. I have yet to try this, but it’s definitely on my bucket list for the semester. Along with the shops, there’s also a fair amount of illegal street vendors. You’ll find these men with handmade cardboard stands, a blanket on the floor with their merchandise laid out, or walking around while carrying the items for sale. The funniest thing about these vendors is how they come out in the rain, attempting to sell a handful of umbrellas to all the tourists without them. These same vendors switch to selling selfie sticks when it stops raining. The weather is much different than I’m used to. It rains a lot here but can change within the hour. Because of this, I’ve found it’s best to dress in layers and always bring either a rain coat or an umbrella. You would think the rain might stop some people from exploring the streets, but on any given day, regardless of the weather, the streets are filled with people. Locals and tourists fill the streets during the day, all accompanied by their umbrellas and rain coats. Much like the ever-changing weather, the drivers are also unpredictable. 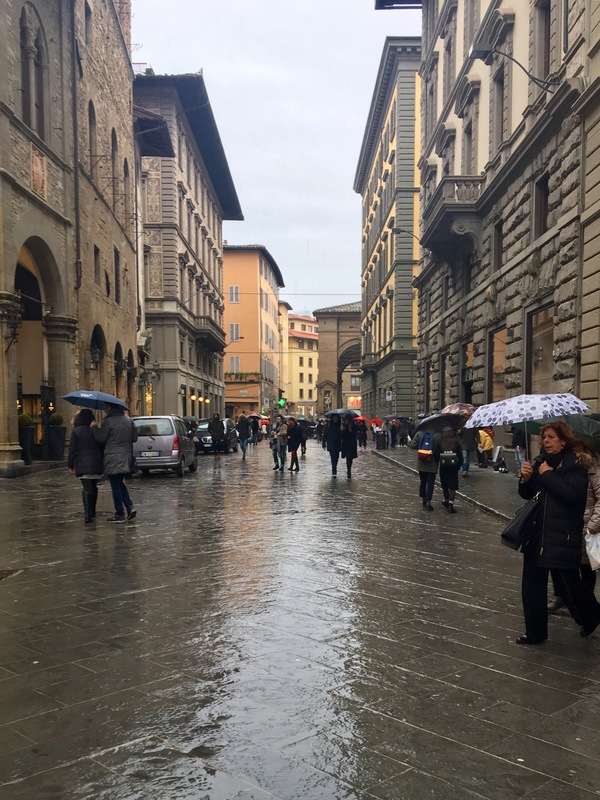 My first time seeing the city of Florence, I was watching from the back seat of a taxi, cringing every other second as we sped through the tiny streets. The drivers will get as close as a foot away from other drivers, mopeds, and pedestrians. Cars here are much smaller and quieter than back home, which makes it difficult to hear one coming up from behind. I don’t know if I’ll ever adjust to the Italian driving style, but the food is something I can get used to. 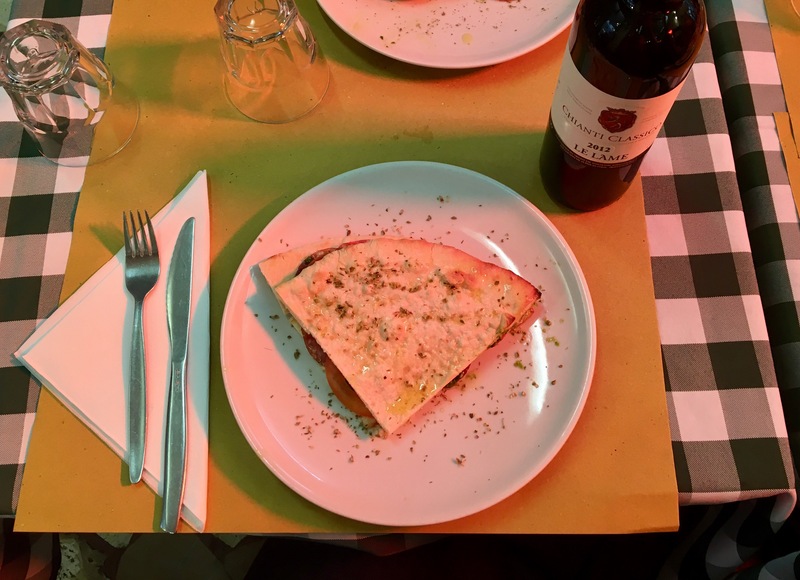 I came to Florence with high expectations for the Italian cuisine, and they have definitely been met. 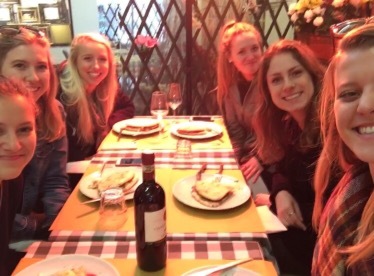 So far, I’ve tried the pasta, panini, pizza, gelato, crepes, and more. Italians eat dinner around 8 p.m. at the earliest, but restaurants and shops open earlier, specifically for us Americans. I have a growing list of restaurants I still need to hit, thanks to recommendations from friends and other travelers. Cheers to free pitchers of wine for students. All of the roommates out for lunch across the river. Panini with pesto at Pino’s, one of my favorite lunch meals thus far! Gusta Pizza compares to Punch Pizza back home. 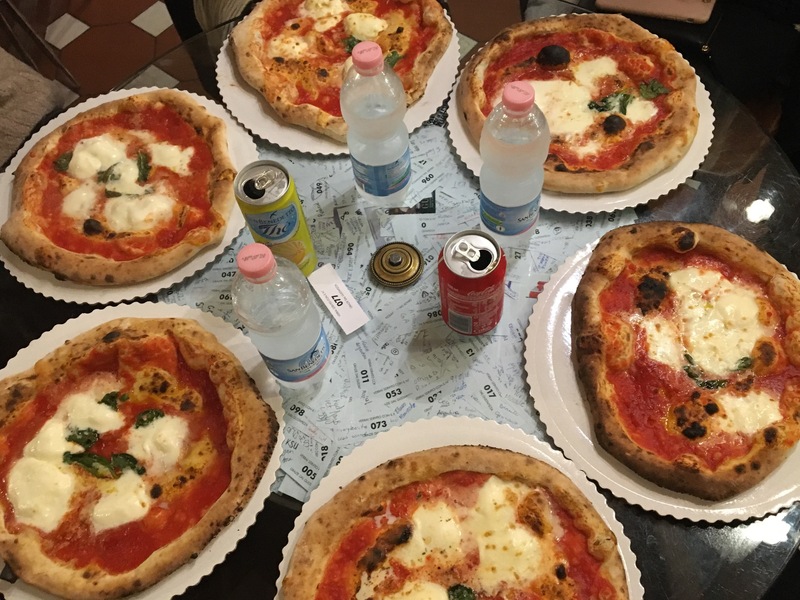 Contrary to this picture, there were many different types of pizza; we all just seemed to have a similar craving for margherita pizza. 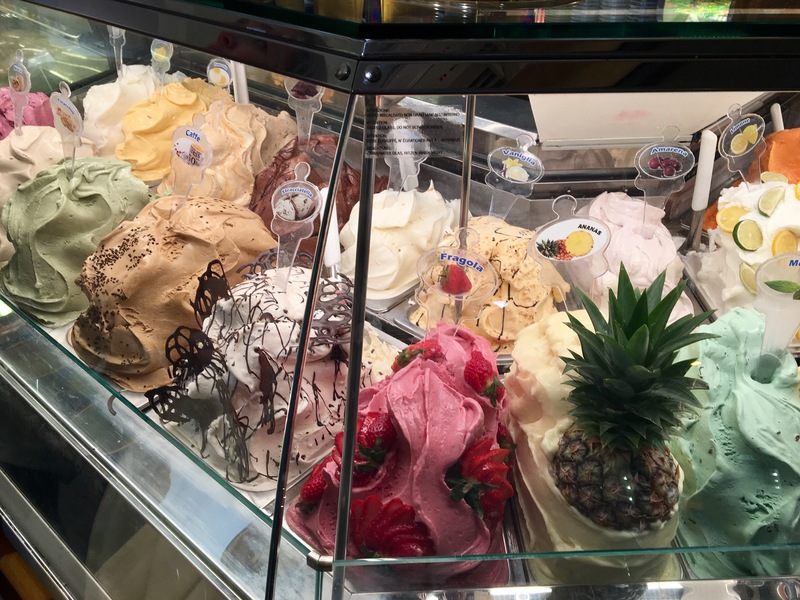 Amazing displays at a local gelato shop… though I’ve been told to stay away from gelato that costs 6+ euros. Our best find yet. 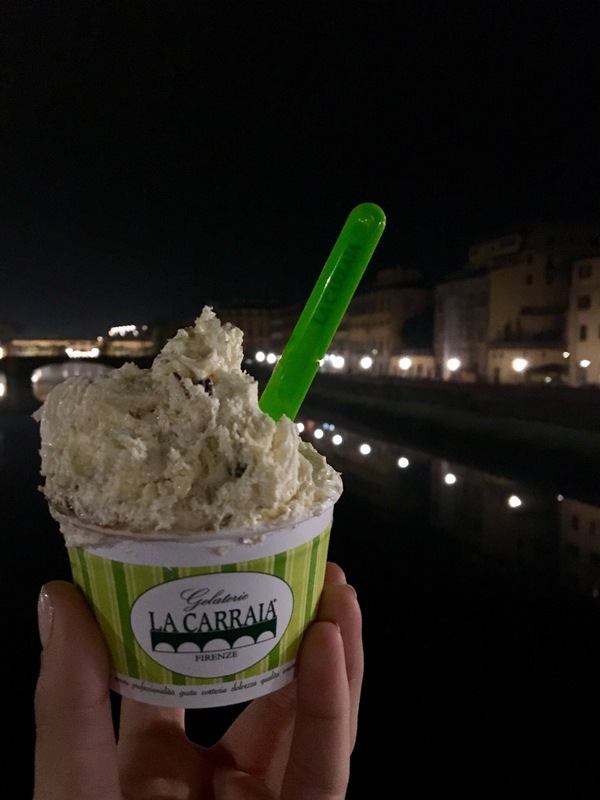 La Carraia gelato has a shop right on the river, the prices are perfect, and each kind of gelato is so delicious, I might have to try them all! Hopefully I will see some nicer weather in the next couple weeks, I would love to continue exploring this beautiful city. Until next time! 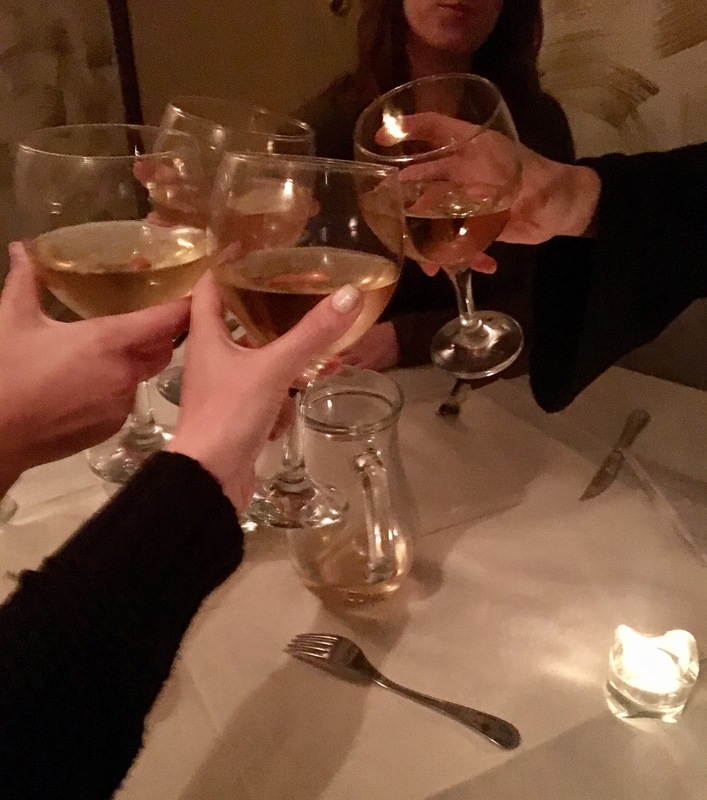 Excellent post and photos Ali! Looks like you are finding just a few good things to eat…and of course shopping! So glad that you are having such fun, love you!